When Dole's brand was used in a viral gag, its comms and legal teams put their heads together to find a proportional response. 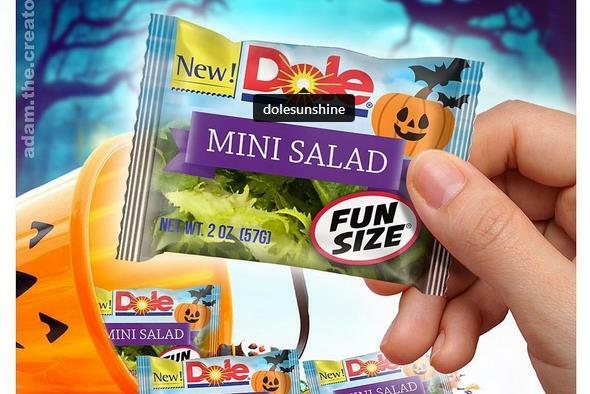 WESTLAKE VILLAGE, CA: In mid-October, a post appeared on Instagram featuring fun-size bags of mini-salads Dole supposedly created as a healthier Halloween treat. The post quickly went viral, amassing more than 33,600 likes. One problem: Dole never created a mini-salad. "Almost immediately after the post went up, the daughter of one of our IT guys noticed it and brought it to our attention," said Bil Goldfield, Dole’s director of corporate communications. Goldfield’s team noticed that most of the people posting about the fun-size bags found the snack-size salads funny, though others said they’d make for a disappointing Halloween treat. Most people realized they were a gag, but some customers did contact Dole asking if the salads were real. "Our initial thought was that we actually liked the message," said Goldfield. "We would love to have kids or anyone substitute candy for fresh fruit and vegetables and produce." Dole decided to defend its intellectual property rigorously, Goldfield explained. Right away, its legal department was brought into the discussion to determine how "hard" the brand had to be with its response. "We knew we had to defend our brand, get across how seriously we take this kind of thing, and make sure [others] know [they] need permission," he said. "But we didn’t want to come across as this ogre that doesn’t know how to have fun because produce can be a lot of fun. We are not above being lampooned a little bit, and this wasn’t hurting our brand." Dole’s comms and legal teams, as well as the brand’s digital and social agency, Kglobal, whittled down the company’s standard cease-and-desist letter. The letter began: "We're thrilled to see you putting so much effort into creating healthier food options. But why stop at mini-salads? Fun-size portions of pineapples, broccoli, carrots, and celery would be the perfect serving of fruits and vegetables for a growing kid." Kglobal created graphics in a similar style to the image making the rounds on social media, showing fun-size Dole bags of pineapples, broccoli, carrots, and celery. The company asked Kglobal if it should add an item to its website about the matter or just respond on social media. The company decided to post once on Twitter. Dole’s tweet gained more than 160,000 views, making it the most popular social media tweet the company has ever tracked. Outlets ranging from The Boston Globe to CTV, the largest television network in Canada, covered Dole’s response to the gag. Most social media responses have applauded Dole’s decision to join in on the fun, said Gene Grabowski, a partner at Kglobal, via email. Dole, you just regained a customer. Classy reminder to Adam. ? Good reaction: a gentle reminder about their trademark, but still showing an understanding of the (Halloween) spirit in which it was used. ???????? wow a classy response from a big corporation. Will wonders never cease. #HappyHalloween ?? "We have seen brands that take things too seriously," said Goldfield. "We wanted to see what the tone was about it, what people were saying, and use this as an opportunity to get the healthy eating message out there and do so in a way that is not overbearing." The mini-salad joke was the brainchild of BrandFire cofounder and director of branding Adam Padilla. Goldfield said it would have been fun to have a back-and-forth with him on social media. However, Padilla found Dole’s response less amusing. "Dole clearly didn’t get the spirit of the lampoon," he said. "It was never intended to be mean-spirited or hateful, in fact it was a loving parody that seemed to place them as leaders of the bagged salad space." Padilla added that Dole’s response was a "not-so-thinly veiled threat" that struck him as "tone-deaf to the power of viral media." Moving forward, Padilla said he won’t use Dole’s brand in any content he shares on social media. "I wonder if Fresh Express would mind the publicity," he added.